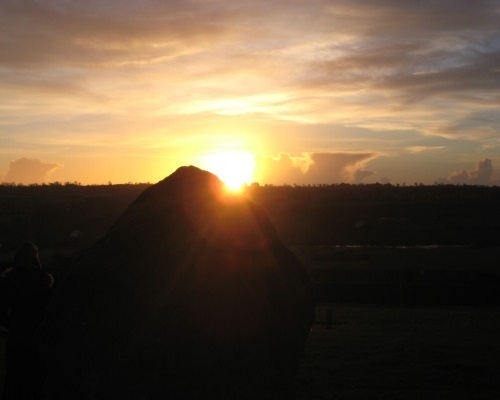 In the valley of the river Boyne, the Brú na Bóinne complex of Neolithic monuments, Newgrange, Knowth and Dowth (and maybe more undiscovered), form a UNESCO World Heritage Site. Newgrange is a large mound, created on the slope of the hillside, with layers of stone and earth, topped nowadays with grass. There is (as known to date) one passageway which goes a short way into the mound, leading to a chamber with three smaller side chambers. Your guess is as good as anyone else's why Newgrange was built. But it was an impressive task, bringing sandstone greywacke kerbstones from up the north east coastline near Clogherhead and quartz from Wicklow / Dublin mountains. Certainly bones have been found at the site suggesting it was, at one time, a tomb and probably a place of worship. 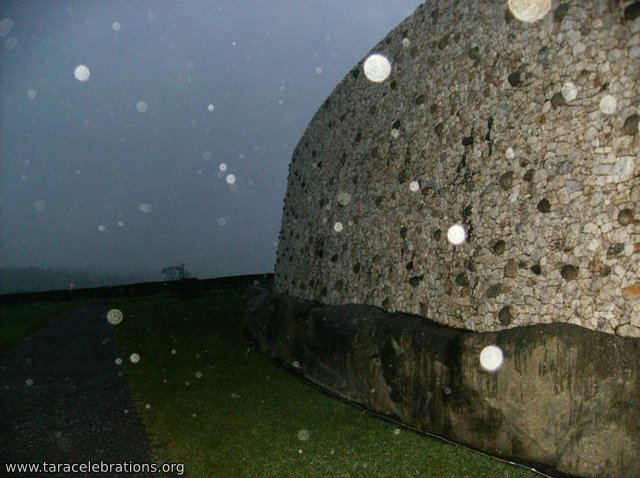 But the most striking impression is of the white quartz front wall studded with grey spheres of stone. 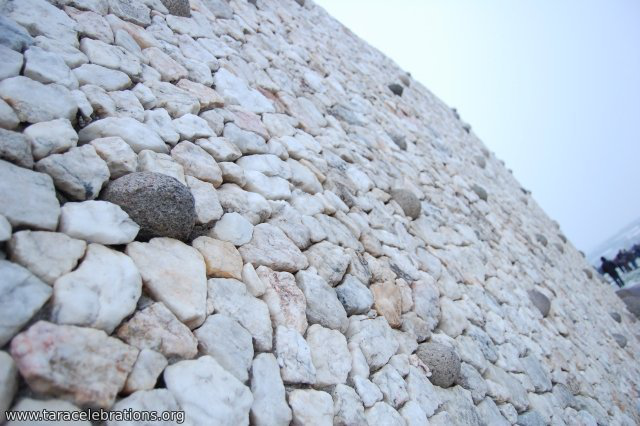 Many archaeologists do not agree with the reconstruction of this wall and believe it was not a facade but was arranged on the ground outside the passage opening. 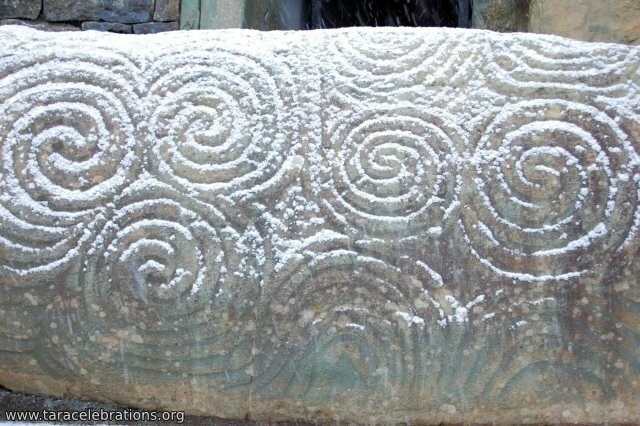 There are intricate curved (mainly circles and spirals) and linear (lozenges and V shapes) carvings on many of the exterior and interior stones. The most well known symbol being the triple-spiral – triskele - that decorates the right-hand side slab of the rear (north) recess of the inner chamber. This is illuminated once a year, at Winter Solstice sunrise. Other rock art is hidden from view, such as that on the back of the stones lining the passageway to the chamber. The two other carved stones most commented on are the entrance stone – K1 – and the one at the back of the mound K52. 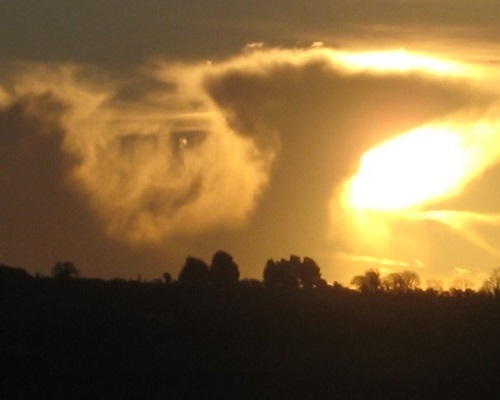 These are in an alignment with the rising sun as it appears over Red Mountain to the south east. 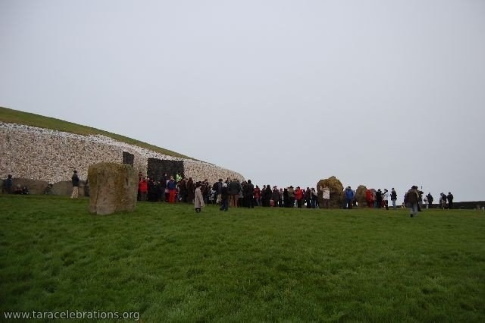 The alignment links the Fourknocks passage grave 13 miles away, the central vertical line on K1, the roofbox above the entrance and is continued through K52. Links have also been made to the rising and setting of stars (such as Sirius) and constellations (eg. Pleiades) which may be recorded in the rock art. The research into these theories is, of course, on-going! Through the half open curtains I can see the snow. The boreen is icy and the sharp sparkling frost dresses the tree's bare branches. It is no compensation to know that Winter Solstice, although the longest night of the year, is not the coldest. Those times will arrive in February. Arising at 7.30am to the glimmer of dawn, I head off to join the hardy, foolhardy and lottery winners making the sometime slippery journey to the Bru na Boinne visitor centre. VIPs and statesmen lead the way, whilst lesser mortals follow – the accustomed format probably down the ages for this ceremony of light. Those gathering are about to witness an occurrence that has happened for millennia, for this monument was built even before the pyramids of Egypt. 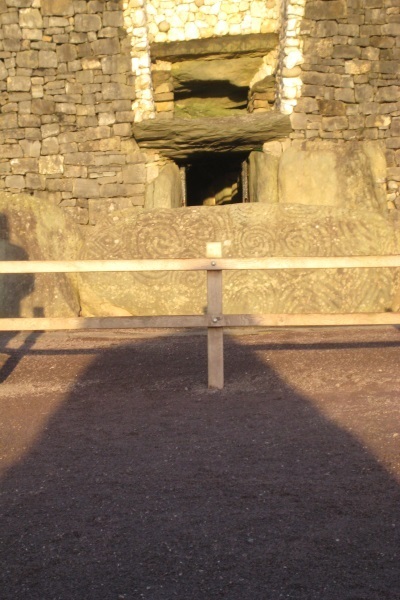 We remember the ancient gods and heroes, mythological characters connected to Newgrange such as Dagda, God of Perfect Knowledge, Boinne, his consort and cow goddess, and their child Aengus, God of Love. We assemble with our family and all those that sat round the home hearth 50000 years ago, now and 5000 years in the future. 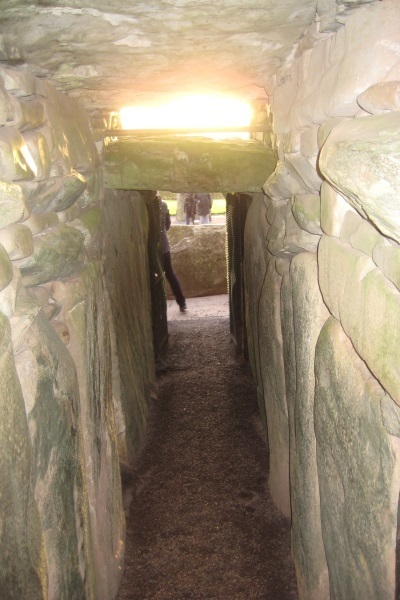 All arrive by 8.50am at the passageway entrance into the great monument of Newgrange, in the Boyne Valley. Some have gained the right to stoop and enter into the recesses of the Mound, to stand in the darkness of the chamber, to wait. The remainder of us stay outside, looking towards the blue misty horizon, occasionally recalling previous events, chatting to old friends and new acquaintances. In the south east, the sky over Red Mountain brightens, yet a linear grey cloud clings to the hill and teases the waiting crowd. Maybe it will move in time, maybe it will thicken and block the light show. A heavy mist hangs over the river in the valley and suddenly everyone feels cold and thinks about warm cups of tea, searching pockets for gloves and pulling scarves closer to cold skin. The warm orange glow intensifies and a cheer rises from the hearts of the several hundred in the crowd. The bright sun has peeked over the horizon. Liking what it sees, and receiving the respect and honour due to it from the human beings, it decides to rise higher into the bleak wintry washed blue sky. The grey cloud dissipates and as the golden orb ascends its beams of light enter through the roof box of the mound. The honey light tracks down the passageway and a shaft of brightness, the promise of the years turning, eventually penetrates to the chamber to glow on the faces of those VIPs, important statesman, and honoured lottery winners who have waited in the dark. In the afternoon a small crowd gather at the monument in Dowth, east of Newgrange. One name Dubthach, attached to this mound, means 'dark house'. This may be referring to the arrival of the dark night as the final rays of the Winter Solstice sun enter the passageway and chamber known as Dowth south. The moments of golden sunset are hidden by tall trees, unless they have had one of their infrequent trim-backs, yet some beams may filter through the branches, at the end of the day, complementing the dawn at Newgrange eight hours previously. Do visit their website before organising your visit as this is a very busy and popular site and tickets usually need to be pre-booked. There is a large car park with picnic area, short walk to the centre where the main facilities are reservations desks, toilets, gift shop and restaurant.